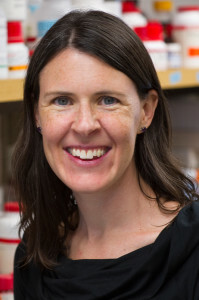 Beth Taylor is an HHMI Instructor in the Chemistry Department at MIT. She works with HHMI Professor Cathy Drennan on initiatives for “Improving Chemistry Teaching and Mentoring Nationwide”. Beth’s educational interests focus on generating free and easy-to-implement materials for chemistry and biology educators. Projects include creating and assessing examples for general chemistry that demonstrate the chemical principles behind inspiring applications in biology, medicine, and MIT research; and a series of two-minute videos that illuminates the who and the why of chemistry. Beth is also involved in graduate student TA and mentor training and in creating resources to address stereotype threat in the classroom. Beth has taught freshman chemistry (MIT Course 5.111), biochemistry laboratory modules (MIT Course 5.36), and the Graduate Student Teaching Certificate Program through the MIT Teaching and Learning Laboratory. Beth is a laboratory-trained chemist. She worked with Prof. Ian J. Rosenstein at Hamilton College and completed Ph.D. research in bioorganic chemistry in the laboratory of Prof. Barbara Imperiali at MIT.